My pancakes were too thick. I like the durian flesh and cream separated although taste-wise it doesn't matter. The filling was mushy because the pillows were not chilled before the photo session. 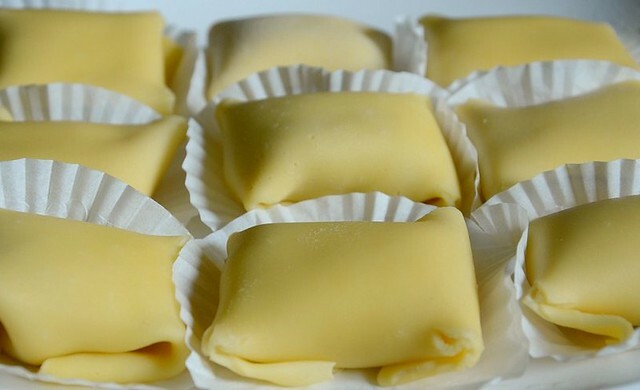 Store-bought durian pillows were thin-skin and small enough for only one mouthful or two dainty bites. Hub and I were at a dinner last Saturday and the host served durian and mango 'pillows', thin crepes stuffed with durian or mango and cream, folded into the shape of a puffy rectangle pillow. The dainty durian pillows cost RM8.90 for 3 (RM5.90 for mango pillows) and were so small that one of them can fit nicely into a Chinese soup spoon. 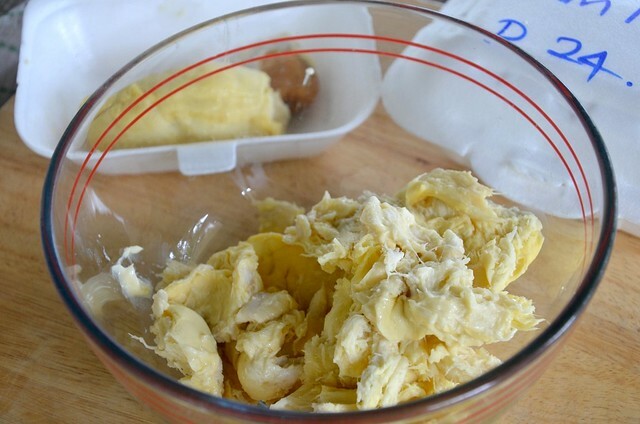 The cream and durian were blended together, a clever way of scrimping on the durian. 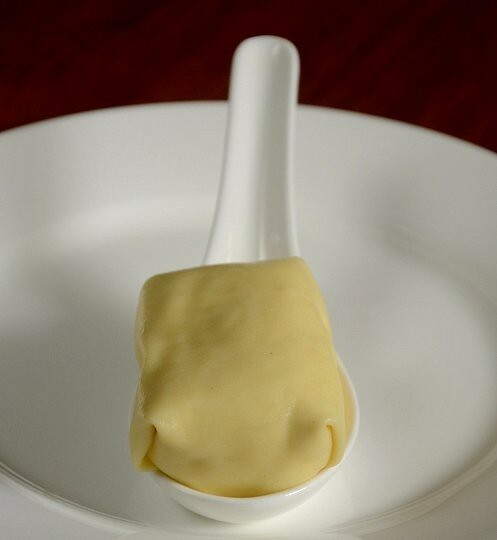 Durian is so strongly flavored that a little bit of it can jazz up a large amount of cream. 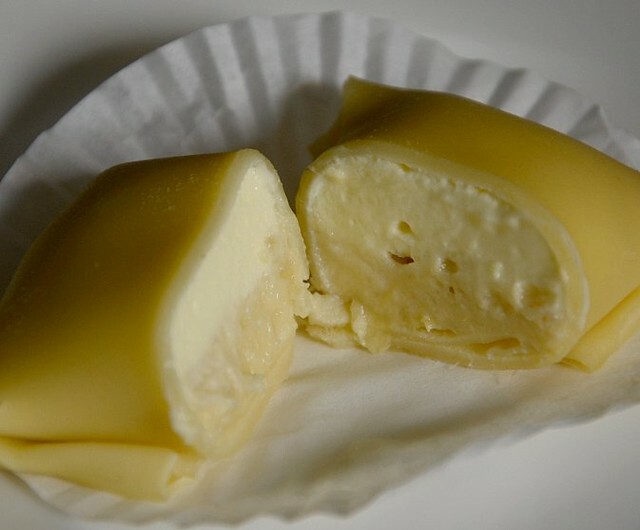 In Hong Kong and Peninsular Malaysia, the cream and durian are in distinct layers of about 50:50. I found the recipe for the pancakes here and was happy with it because the pancakes turned out very smooth. However, my pancakes were three times as thick as the store-bought ones, which was why the corners of my pillows broke and also why I couldn't get the pillows to look puffy without making them the size of an egg. I took one of the store-bought pillows apart and found that each pancake was half a pancake. Maybe the trick to getting a very thin pancake is to pour the batter into a cool non-stick pan, swirl the batter so that it spreads out thinly and then put it over a low fire and cut each pancake into half. I'll do that next time. I thought I'd like the 50:50 ratio of durian to cream but found that the pillows taste smoother and better if there's more cream. The best durian for this is kampung (village) durian because they simply taste better. Also, I find that some of the new hybrids have a strong raw onion flavor. I used coconut milk as per the recipe but I've changed that to fresh milk in the recipe because I found that coconut milk messes up the durian flavor. The store-bought pillows didn't have any coconut flavor. With the replacement of rich coconut milk by the fresh milk, a bit of melted butter will keep the pancakes softer and tastier.I used organic eggs to give the pancakes a bit of color. This dessert is simple and quick to make and you'll get plenty of "ooohhhs" and "yummms" especially when the pillows are served very chilled, with a good coffee. Allow at least 4 a person; the pillows are really that good. For making durian cakes and desserts, boxed durian will work out a lot cheaper. Get them late at night when the vendors slash their prices. *as advised by Zurin, an extra yolk will make the pancakes softer and easier to fold. 1. Mix the pancake ingredients together. Pour batter over a sieve into a bowl to get a fine and smooth batter. 2. Lightly grease a non-stick frying pan with melted butter and pour in a small ladle (you'll have to find which size is best; try making a large pancake and cut that into half) of batter and swirl the batter around to get a very thin pancake. Cook over a low fire until the pancake is done. It takes less than 30 seconds. No need to turn over but if you do, turn over for two to three seconds only. Repeat until all the batter is done. Cool. If like, you can grease the frying pan before every ladle of batter is poured. note: as advised by Sonia, to get thin pancakes, pour more than enough batter into the frying pan, swirl the batter to cover the whole pan and then pour the extra batter back into the bowl of batter. 2. You can blend the durian flesh or mash it with a fork. I think I prefer to mash with a fork because the blended durian was too mushy and the fibers were all cut up. 3. You can mix the cream with the durian or leave separate. 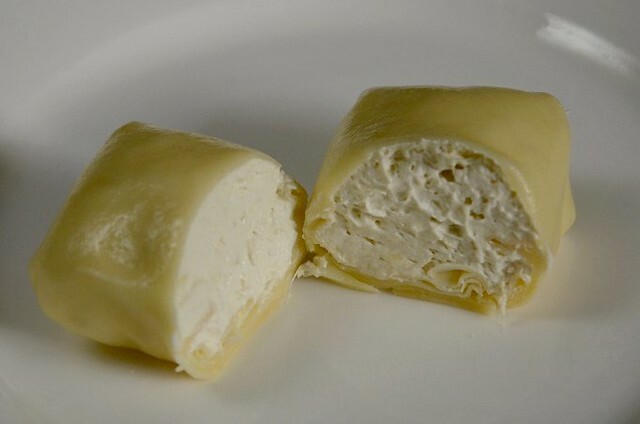 Put a heaped tablespoon of whipped cream onto the center of the pancake (smooth/unfried side facing plate), top with a level half tablespoon of durian flesh, and fold into a small, puffed rectangular pillow. 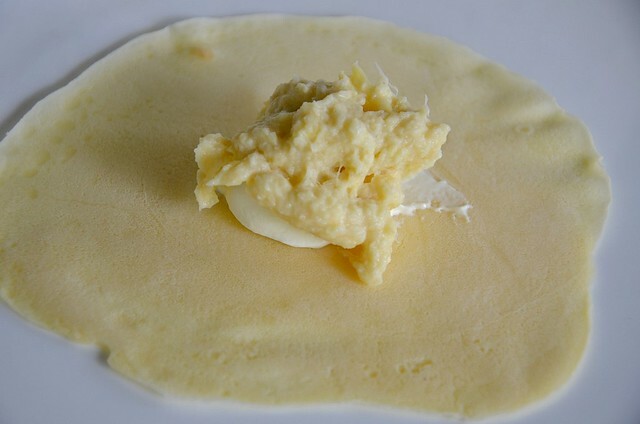 If you have mixed the cream and durian, just plop a large tablespoon onto the middle of the pancake and fold. Chill very well before serving. Wondering if using the Kueh dadar skin would be good for this? Maybe a tbsp of sago flour will gives a softer texture to the pancake. I would also substitute the milk with light coconut milk instead. That's my suggestions. Cos I'm a kueh lover and already imagination the dadar skin with this durian cream. Omg Terri - you always know what recipes I'm mentally thinking of trying next..... each time I want to research to bake or cook something - you do it and I'm ever so grateful for it. Remember the baked pork ribs for my son's birthday party?! Now these beautiful looking "presents" are taunting me ;-) Can't wait to try them. Thank you, thank you, thank you. winston: ah u hv to tell ur mom to freeze some durian flesh bc by the time u get back the fruits'll be gone. Your durian pillows were very tasty. Admirer from Muar, Johor. I really hope to make this one of this day, err....somedays,when? I love durian pillows, whenever I'm in KL,I'll get some at Mid-Valley just to satisfy my cravings. Will let you know if I make the durian pillows. :-) Thanks for sharing. Terri, this is how i make thin crepe. Usually i will put a big spoon of batter (slightly more than entire pan) in a hot non-stick pan, quickly swirl the batter for a thin layer, and quickly pour out the excess batter, continue cook. Once cooked, then trim off the uneven crepe. zurin: thnx for the tip, i'll note tt on my post! sonia: how clever! i'll note tt on my post, tq! Wowzers!! Can't wait to try your recipe.